What chapter is this anyway? I like books. They have a multitude of purposes not the least of which is making people look good. 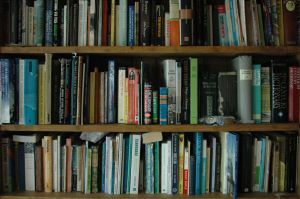 How many times have you gone to someone’s house and, while they left the room to prepare a little something to “tide you over” as my Mother would say, taken a good look at the books they have so carefully and strategically placed on their shelves? The thing is, bookshelves are a lot like Facebook profiles, constructed to reflect the image that their owner wants to project. And it’s really not that hard. Let’s say you want people to think of you as “retro hip”. Add a few Hunter S. Thompson’s to your collection of Kerouac novels, pepper with a little Tom Wolfe and you’ve got yourself a persona. Perhaps radical politics is more up your alley. Place the three volumes of Marx’s “Capital” front and centre, surround with some Saul Alinsky, Noam Chomsky and “Plato’s Republic” just to show depth, and you’re set. Fancy economics as your claim to fame? To do this right you’re going to need some balance. Milton Friedman, Naomi Klein, Adam Smith and Marx (again) should do the trick. Throw in a copy of “Freakonomics” just to let people know you have a sense of humour. I could go on but honestly, this is not rocket science although if that’s your goal try some Sagan, Hawkings and Michio Kaku who, although born and bred in the USA will at least appear to add an international flair. Books can also make you look smart. Unlike those electronic reading machines, when you carry a book people can actually see what you are reading. Or at least what you appear to be reading because we all know that you don’t actually have to read the book to make people think you are smart. I mean when was the last time you actually walked up to someone to quiz them about the book they were holding? It’s just not going to happen. Of course if it does happen there are some stock responses you can use to maintain the illusion. If it’s non-fiction you’re holding go with “she presents a new and interesting theoretical perspective that really ought to be considered given how tired the previous iterations and approaches to [insert topic here] have become”. That should stop any further inquiry. When it’s a novel you’ve got I suggest “I’m afraid the character development is weaker than in his past work but I’m plowing my way through hopeful that some of his literary genius will become evident in the later chapters” which will not only demonstrate your ability to critically analyze the current work but will also let people know that this is not the first and only book you have read. So be as esoteric in the selection you carry as you want and make sure to keep the cover facing out. But what I like most about books is that they have a beginning, a middle and an end. As you read them you know exactly where you have been, and where you are going. It also means that you have a pretty good idea of when you are going to be done. Which is why I look back somewhat wistfully on the advice my son (I have two of those) gave me when I first started to write this blog. He said (and I quote) “Mom, you should write a book about being shallow, not a blog.” Because unlike a book, a blog has no natural end. As I look back at my 27 posts I find myself asking “what chapter is this anyway?”. For all I know this thing could go on forever, an especially daunting conclusion to arrive at when your Grandmother lived to be over 100 and your Mother and her sisters are respectively 97, 94, 91 and 80 years of age. The thought is so overwhelming that this week I have sought refuge in my “one week at a time” mantra. Looks like it worked. That’s another week in the bag. Hmmm, what does all seven Harry Potter books and a bunch of recipe books say? Your Life will have a “Final Chapter”……..so until then, keep on Blogging! I need something to read until I can get around to all those books on my shelves! Good to know you see this an alternative to your books. Let’s just hope that the blog ends before I do.